Bring your family, friends, and pets (Pets must be leashed) on Saturday, March 30, 2019 from 9am to 12pm and 1pm to 3 pm. Please note, we reserve the right to cut the line before 12pm so that the Easter Bunny can take his well deserved hour break. Doors will be open during this time. 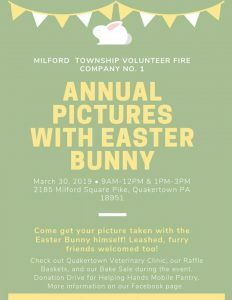 While you wait, check out Quakertown Veterinary Clinic for information on what services they offer and browse by our Raffle Baskets and Bake Sale as well. 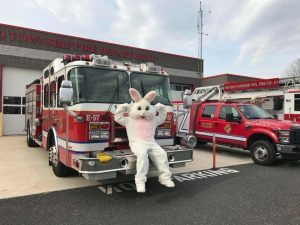 It is also a perfect time to meet some of your local heroes. Our professional photographer will take your photo and it will be printed on site with a professional printer! During this event we will be holding a food drive for Helping Hands Mobile Pantry which serves Milford Township! For every three non-perishable items donated you’ll receive one free raffle ticket for the baskets.